Your words can hurt others. Your words can hurt you too. I’ll never forget it. I was a newly minted teenager. Full of myself. Angry at my little sister. I’d done something hurtful to her in my anger. She told Mom. I got in trouble. Then, in the self-serving righteous indignation that my sister was really wrong & I was really right, I got even angrier. In my anger, I recall making a conscious choice. A choice I’d never made before but knew I’d act on now to express the depth of the mistreatment I felt I was suffering. I cursed. To my mother. I don’t remember much that happened after that. Mom’s eyes on fire. Her hands like lightning. Jerked up her jerk son. Yanked my mouth opened. And filled it with a pump squirt of LOC. Soap. 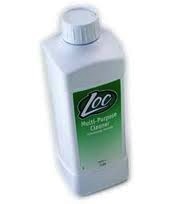 Amway’s LOC (Liquid Organic Cleaner) was kept under our kitchen sink since it had many household uses. “Multi-Purpose Cleaner” the label says. “Washing out teen boy potty mouth,” was just one of the many uses my Mom had now discovered. I learned a lesson that day. Not the apparent, “Don’t be dumb enough to curse in front of your God-fearing Mama.” I had calculated the use of that curse word to hurt others, but that word ended up hurting me. That was the real lesson. There is enough hurt in the world, don’t you agree? Why don’t we make a decision - actually many, daily decisions - to use our words to help instead of hurt? Blessing instead of cursing? Praying instead of complaining?